Prototype: Type DE 1002 general-purpose locomotive as double motive power. Locomotives used on the Cologne Harbors and Freight Service, Inc. (HGK). 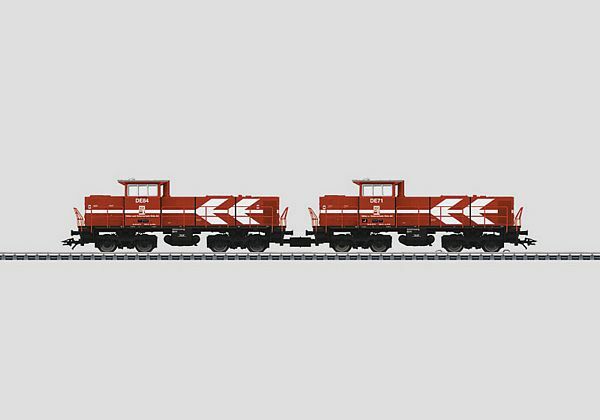 Model: The locomotives have an mfx digital decoder mfx and extensive sound functions. One locomotive has controlled high efficiency propulsion. It also has a powerful motor with a bell-shaped armature and a flywheel. 4 axles powered. Traction tires. The triple headlights (maintenance-free warm white LEDs) and dual marker lights (maintenance-free red LEDs) on both locomotives will work in conventional operation and can be controlled digitally. The locomotives are connected by a current-conducting close coupling. Length over the buffers 33 cm / 13. MaK type DE 1002 with sound for the first time.